304 pages | 17 Color Illus. | 80 B/W Illus. Conservation planning involves targeted management practices and land use decision-making based on careful analysis of landscape limitations in order to protect soil and water resources. Developing solutions to conservation planning is of worldwide interest due to anticipated population growth, growing demand of feedstocks for biofuels, decreasing freshwater resources, and increasing land degradation in the developed world. Recent advances in geospatial technologies now provide land managers with tools and resources to conserve soil and water resources more efficiently than has ever been possible before. 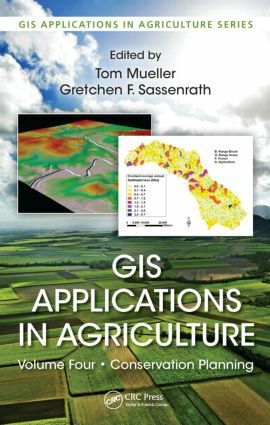 GIS Applications in Agriculture, Volume 4: Conservation Planning presents approaches developed by leading researchers working at the intersection of conservation and spatial technologies. Among others, the technologies include global positioning systems (GPS), geographic information systems (GIS), Internet mapping technologies, remote sensing, and various modeling applications. These advances allow improved prediction of soil erosion and environmental effects, better prioritization of land for conservation initiatives and funding, and enhanced prediction of the impact of management practices on natural resources. They also facilitate the development of conservation management plans and improve the accessibility of conservation knowledge and tools. The strategies presented are designed to provide the greatest benefit to preserving natural resources while reducing economic expenses. Each chapter includes a detailed background on the specific topic, with case studies describing the design and implementation of the solution. Readers are guided through step-by-step exercises to gain experience in executing the conservation practice. Substantial online data and modeling are available that can be immediately implemented or modified to suit users’ needs. The exercises are accessible enough to be used in the classroom, yet detailed enough for self-instruction by highly motivated professionals active in developing conservation plans. Tom Mueller, PhD, is an agronomic data researcher at John Deere and Company in Urbandale, Iowa. His work focuses on data analytics and introducing new technologies into the MyJohnDeere platform. Dr. Mueller has a passion for using geospatial tools and technologies for conservation planning and natural resource management. Gretchen F. Sassenrath, PhD, is an associate professor of agronomy at Kansas State University Southeast Agricultural Research Center, Parsons, Kansas where she conducts research on integrated crop and animal production systems that improve agronomic productivity, enhance soil and water resources, and increase economic return for producers.